Harry got invited to the Philadelphia Flyers hockey game the other night. He doesn't like lentils, so guess what we had for dinner while he was gone? Something quick and easy with lentils of course! 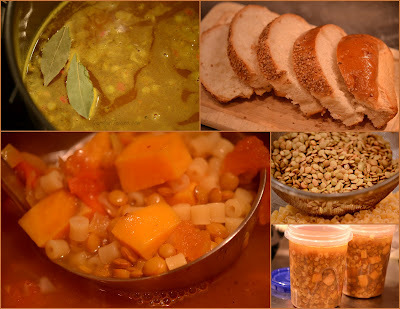 What could be easier than a pot of hearty soup on a cold winter night? Making your own soup is so easy; extra soup can be refrigerated or frozen for another meal too. Homemade soups generally provide a lot more nutrients than store-bought canned soups, not-to-mention that they can be made using a fraction of the salt. For example, this recipe contains less than half of the sodium found in Progresso reduced sodium chicken noodle soup, and has 75% more Vitamin A and 18% more dietary Fiber. You can be creative and create a soup using ingredients you have available. Here is the recipe I concocted for the Lentil Chicken Noodle Veggie soup. It made a great one-pot meal served with a side of fresh bread. I made it for just two of us and refrigerated the extra for healthy hot lunches the following days. After working in the industry making large commercial broth batches that required using ingredients that you would never use at home such as, sodium hydroxide to adjust pH and dextrose - I rarely use store-bought broths in soups. Water works just fine and is plenty flavorful after adding in all the veggies and aromatics. In the stock pot you plan on making the soup in, over medium high heat; add olive oil. Saute and partially cook chicken pieces. Remove and set aside when lightly browned. Add onion, hot pepper and potato to the pot; stir. Let cook 5 minutes or so, stirring occasionally. Add garlic and ginger, stir again. Add water, lentils, bay leaves and remaining ingredients; stir. While waiting for the potatoes to cook; heat a smaller pot of boiling water and cook the pasta al dente. Drain and stir the noodles into soup. Heat thoroughly and serve with a side of fresh bread and Parmesan cheese.